A maltipoo is the result of breeding a Maltese dog with a miniature poodle. Maltipoos are friendly and outgoing, yet highly strung and nervous. They come in a variety of colors and hair types. 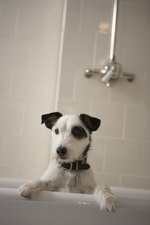 Some hair types are more maintenance-free than others, but all require some care as the fur is extremely long and can interfere at times with the dog's normal life. This cut consists of 3./4 inch to 1 inch long fur on the body of the maltipoo, with the tail left bushy and natural while the facial fur is trimmed in a round shape. The ears can either be left natural or also trimmed in a rounded shape. This type of cut looks best on dogs with straight, silky hair. 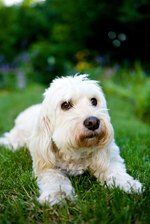 The curly haired maltipoos require a low maintenance cut or their fur will mat into knots. The fur is cut to 1/2 inch on the body and 3/4 inch on the legs. The facial fur is cut round and poofy, much like the puppy trim. The ears can be left natural, trimmed round or shaved with tufts of fur at the ends, resembling tassels. The wavy, bristly fur of some maltipoos is difficult to maintain and this type of coat can sometimes be representative of birth defects in the dog. This cut should be kept short all over the body unless the legs have knee defects or are bowed. Longer hair on the legs helps hide the deformity. The tails are usually left natural. The feet of a maltipoo require extra care during the winter. They can easily become encrusted with snow, ice and salt. Keeping the long hair between the toes trimmed level with the foot pads keeps the snow from getting stuck between the toes.